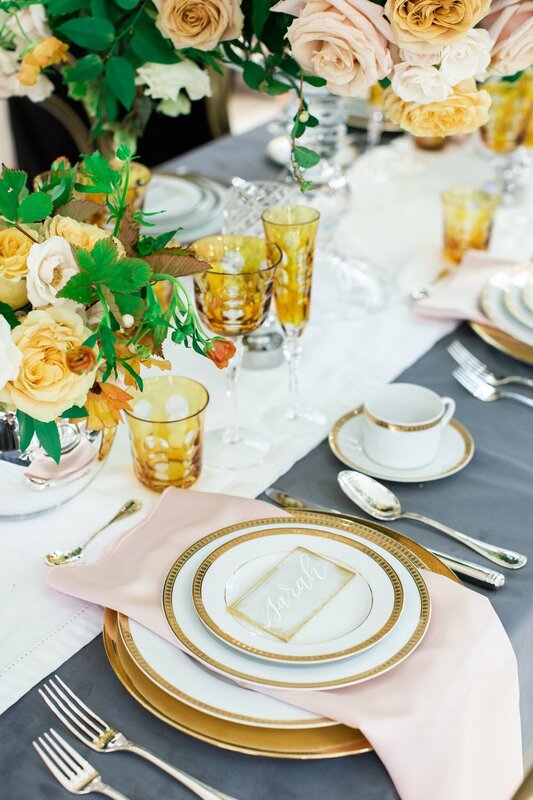 After receiving china, whether it be passed down from a family member or gifted from your wedding registry - we tend to continually set the table the same way over and over again. It’s easy, you already have the design memorized and everything needed. However in this Southern Table Scape Series we want to show you ways to simply change a few minor details for a completely different look. Use your china pieces as the inspiration for your details. This plate’s navy color is repeated in the candles and the blue touches in the floral arrangements. We pulled from the white of the blue and white and layered it with the linen and charger. Don’t over think it, repeat colors makes it easy, timeless and beautiful. Whether it be in the table linens or the napkins, changing the color and texture of those details can make an impactful difference. For the look bellow, we went for a monochromatic route with the china and linens. Sometimes we are afraid to add a bold linen, but as you can see this blue on blue is so fun and different and truly highlights all the shades of blue in the china. You can never go wrong with taper candles. Whether it be a more casual place setting or special occasion taper candles add another level of detail to your table setting that can really pull out fun details in your china. This is an easy color detail to continuously change. And our absolute favorite, getting creative with your flower color options. This is the easiest way to drastically change your table scape, from season to season or occasion. Your flower color choices can change the entire aesthetic. Committing to another linen, napkin, or charger might not be in the immediate list of to-do’s. Instead, order some flowers for the special dinner in a different color palette that you are used to and watch it quickly transforms a space. 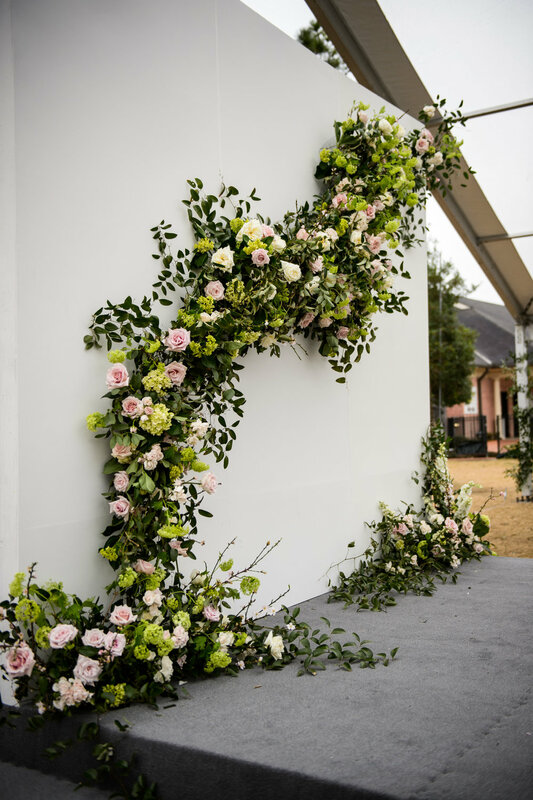 Iron gates at Houston Oaks Country Club covered in greenery and roses to create a climbing rose bush romantic feel. Creating a wedding from scratch is a daunting task. It’s difficult for us, and we do this every day. There are so many decisions to make and considerations to take. One of the more important ones is choosing your flower designer. I don’t have much to say here on this post about how to choose one, as it is as simple as choosing your Dr. Read reviews, ask friends and go to a consultation. Do you like them, do you have an innate trust in them, have you reviewed their work? Great, then book them. Now what? This is what I want to dive into. And here are 4 tips to making this process as easy and seamless as possible. Is there a favorite pattern, color, art work, piece of architecture that inspires you? Is the venue or your dress inspiring the aesthetic? Find the item that inspires you and bring that to your consultation. Designers want to know what we can build from. Give us a little something and let us create from that point. Hand over your trust and allow a professional to create. We love your opinions and absolutely need time during our consultation to hear about your vision. When that time is up, we need room to let ideas grow. When hiring someone it is important that you will have complete trust in their abilities. When micro managing a creative the inspiration to create new innovative ideas dwindles. Be truthful with budget and design and communicate any changes that might have occurred. Budgets change, color choices might need to be updated. This is ok. Tell us. Nothing is too late to update and our 30 day out review is a perfect time to make that happen. Gorgeous detail shot of groom’s boutonniere. Made with ranunculus and a touch of jasmine. After all this work, you deserve to sit back and enjoy. Decision making is tough and we understand how overwhelming it can be. This is where we shine and produce the work we are best known for. Allow us to wow you and make your wildest dreams come true. let's splurge on flowers, but where? Many times we find that our clients are confused on where to spend their money. We work in a creative industry that allows so much room for flexibility when budget is concerned. But with all budgets, large or small we are convinced that you need to have 3 main area where you should spend your money on your wedding. Sorry gentleman you are being left out of this one, unless you are wanting to cary a bouquet too. This is an important one that I have seen left out. Someone said not too long ago that what’s the point of splurging on a bouquet when they would only be holding it going down the aisle for a couple minutes. EEK! Where do I begin? Let’s just list off all the monumental shots that your amazing photographer will capture that will have your bouquet. Walking down the aisle with your loved one as you go to meet your partner down the aisle. 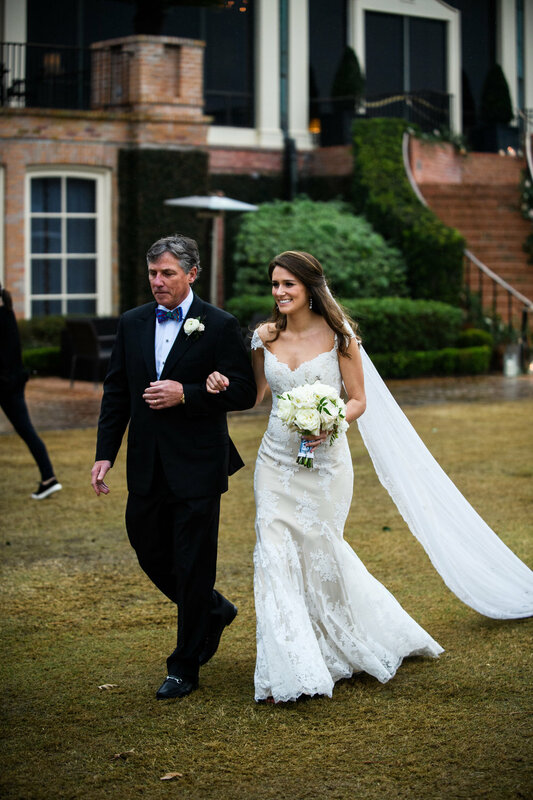 Your father, uncle, mother, that special person that means the world to you will be walking you down that aisle and that moment will be captured in your memories for a life time. When you just got done getting married and now walking down the aisle with your life partner. That bouquet is the perfect decor piece. Family, bridal party, your portrait, couple’s portrait, bridesmaids shots, etc all these pics that we so fondly look back on, all have your bouquet. Trust me on this one, you want one and you must hire someone that makes fabulous bouquets. This is it, once in a life time. 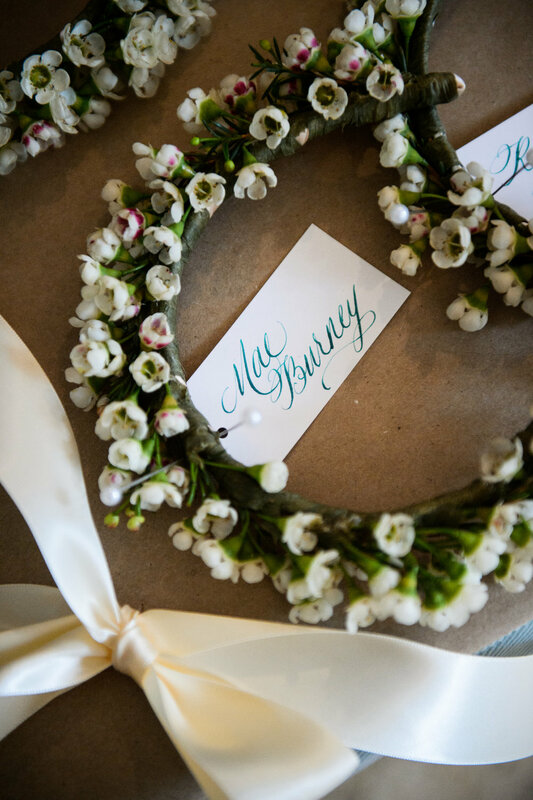 (I couldn’t say that with a bouquet as we, in The South, take bridals, so many times our brides does cary a bouquet more than once) But your head table… this is it. The one time that you get to indulge yourself and your immediate family and bridal party with an amazing, over the top experience. It creates an anchoring spot for the room and it allows you to sit in a moment where all the most abundant florals and decor will be placed. And let’s face it, the photographer is not capturing every singe table. They will walk into the room and capture the table that has the most decor, where all the details are centrally located. Either creating a hanging installation or a band front. We suggest having this as one of your main focal points. This is where your first dance will be, your father daughter dance and all those fun, gushy speeches will be held. It is the main gathering location for the rest of the evening. Do not leave this are left out. We have created band fronts, hanging installations and even added 4 pedestals around each side of the dance floor to help create an intimate area where all images are captured. Allow us to be creative and make something that will be captured and remembered for a life time. While many people might sell you on a simple bouquet. 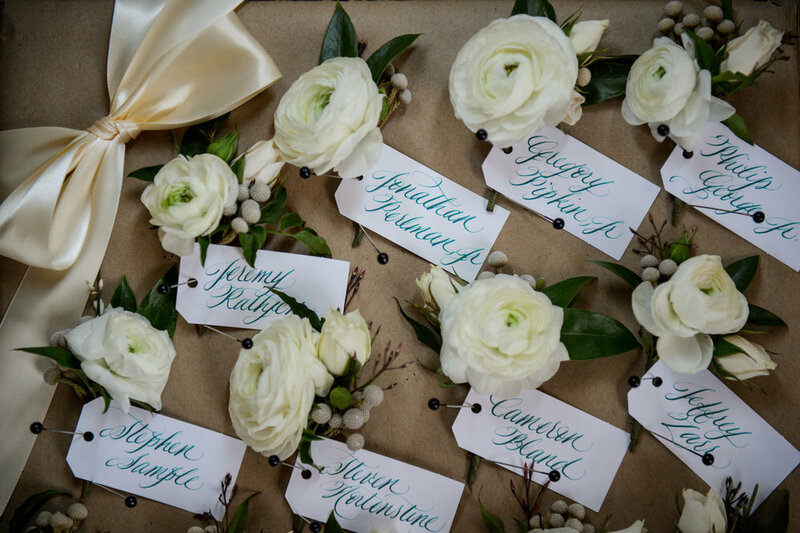 Splurge, this is the only time you will ever cary your dream bouquet. I can promise that it will be completely, totally, worth it!!! I have heard designers mention that they don’t focus on the bouquet because you only cary it for several minutes down the aisle. Sure, they are correct. But what about the images that get captured that last a life time. Who doesn’t want these dreamy, artistic images of their girls and their new hubby. There is so much artistic talent goes into creating one of these beauties, ok I am tooting my own horn. But seriously, we were not able to make this year one, two or three of learning design. It is not easy and therefor should have a moment in the spot light. And for the record, we have had some stunning bridal bouquets that are 1/2 this size. Size does not matter in the bouquet world. Quality flowers, shape and design is where the magic happens. Make sure to allow a healthy budget for those specialty blooms. Our favorites? Garden roses, peonies, spray roses, lisianthus, and ranunculus to name a few. And let us not forget, the photographer. It is important ya’ll!! 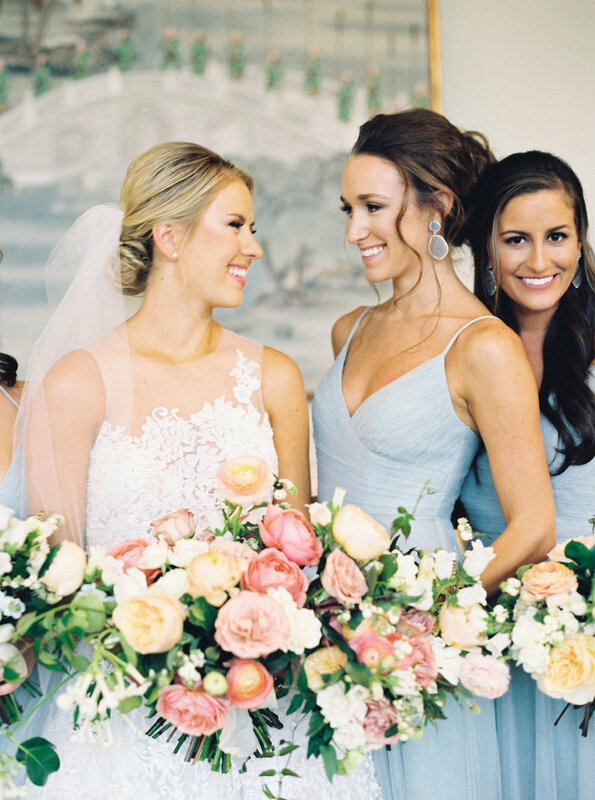 These images you see were perfectly captured by Josh & Dana Fernandez. And shall we not forget, the hard work of Mallory at Two Be Wed.
Bride and bridesmaids bouquets. Shot by Josh and Dana Fernandez in Rive University. Bride and her bridesmaids, shot by Josh and Dana Fernandez inside Rice University. We love a good come back, and mauve has exceeded our expectations. She not only came back but has made a huge statement in the wedding world. There are so many directions she can take as both blush and lavender tones are intermixed through out her. This time we focused on the lavender and purple hues that are so striking and timeless. We wanted to experiment with including all color tones from white to dark plumb. We incorporated all the colors through the color wheel that would bridge these two colors together and mauve was the perfect tone. Flower farmers have yet to grow too many varieties allowing this elusive color to still be hard to find. It makes this colored flower so exciting to work with as we are still learning how to experiment with it and incorporate it into our arrangements. Black modern vessel with a garden style arrangement. Mauve, purple, ivory colored flowers. Maxit Flower Design. The owners of Houston Oaks Country Club brought this gorgeous chateau from Europe. How could it not be one of our all time favorite locations to create a wedding? 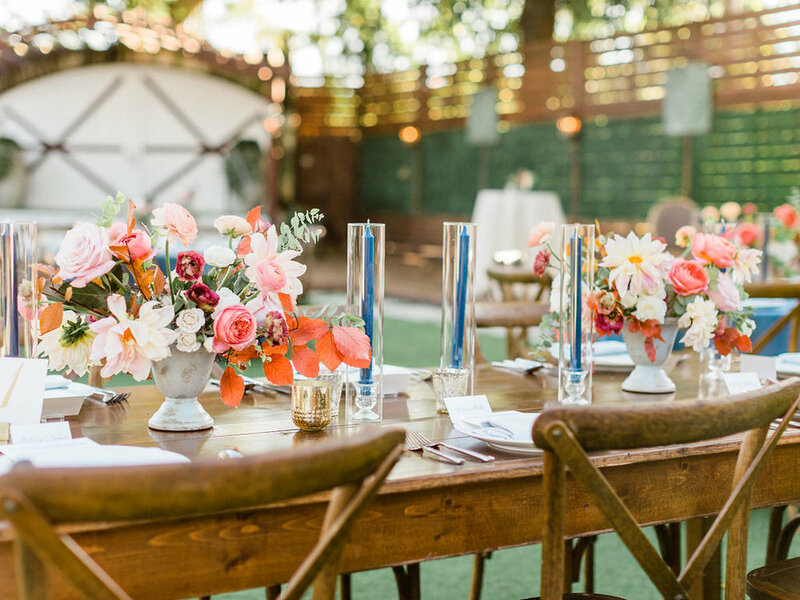 This ethereal, dreamy location has everything you could want to celebrate such an important date. The chapel is surrounded by a lake and large old oaks. It is simply as magical as it gets. Every detail was thought of and the venue is impeccably maintained. The bride and groom suites are to die for and sets the tone for the rest of the wedding. Here’s a wedding we created that we are so excited to share photographed by Silhouette Studios and planned by Alyssa Meeks Events. Aisle and altar wedding flowers at Houston Oaks Country Club. Alyssa Meeks Event Planner, Silhouette Studios Photography. Several years ago Garden & Gun reached out to do a feature on us. We were over the moon that this amazing, Southern magazine would highlight us. I have known about their work and could not believe they knew who we were. They represent the Southern person. Highlighting both masculine and feminine hobbies, this magazine has a little bit for everyone and that is what I loved the most. Since this feature, that happened several years back, we have maintained a relationship with them. They have reached out for arrangements and as you will see bellow a fun event where we collaborated to make a special evening. Garden & Gun just recently also launched an event series that host Southern styled events in locations through out the South. Several months ago they chose Houston to highlight some chefs as Houston is known for their amazing food! We are so luck y to be surrounded by some of the most talented chefs in the States. We used this super traditional and timeless cement colored garden urn for this bar arrangement to create hight and allow the colors to speak for themselves. Garden & Gun asked for a bright Fall color palette and we delivered. These tones are bright and cheerful, yet keeping the Fall palette in mind. 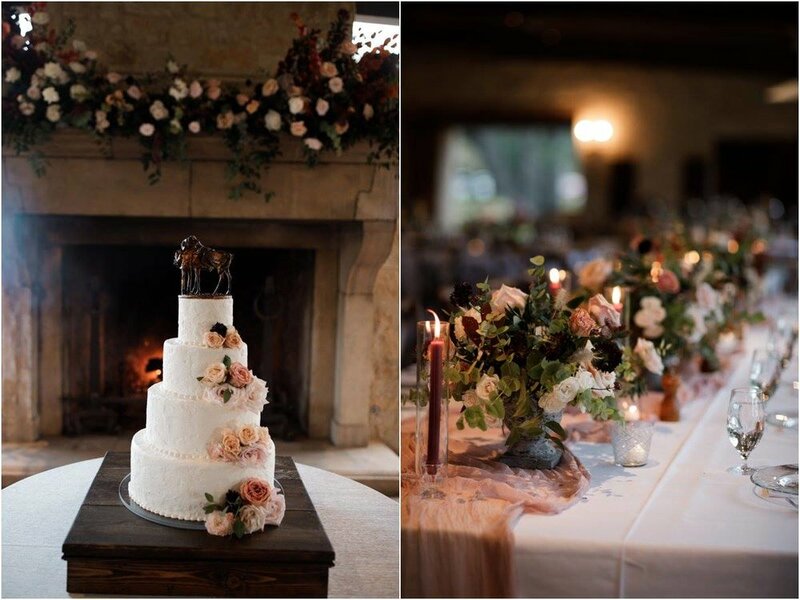 We used dahlias, lisianthus, garden roses, eucalyptus and fall leaves to make an painterly, artistic arrangements. 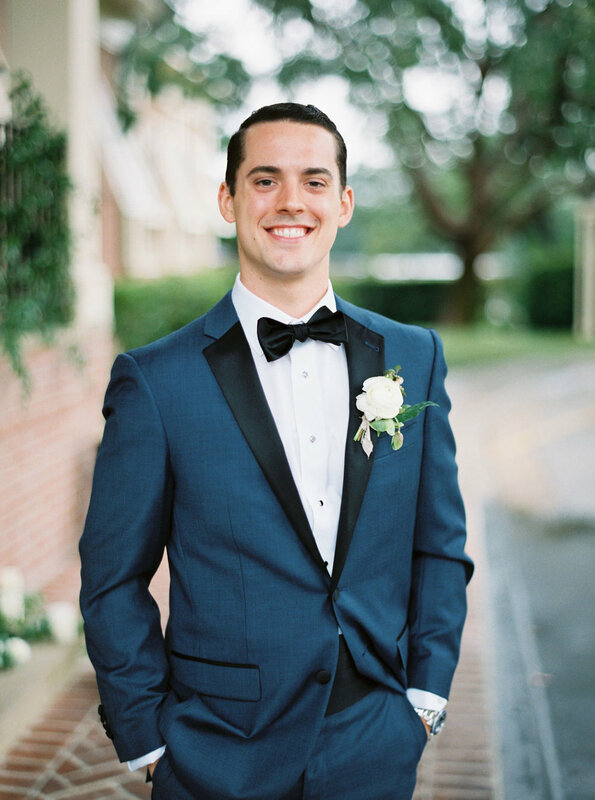 Adding the pop of blue was the perfect touch to keep that masculine feel that is so well known from Garden & Gun. It was the perfect contrasting tone and believe it really added so much interest. Taper candles has recently made a come back and we love it. This detail is so classic. It is such an easy statement to say and I wholeheartedly believe that, we aren’t the right fit for everyone. But the day in and day out of that statement is so much harder than I thought it would be. After I meet with you, I literally started envisioning us creating the flowers for your special day. I day dreamed of the flowers, the textures, the new vases we would source. The excitement to tell my employees that we would be working at the venue you booked, with your photographer, with your family. My passion is what built this business. There were no previous owners, current owners who assist, parents money, partners, investors etc. JUST ME. Yes of course I have some of the most amazing employees that have ever existed. But I still answer every email, every inquiry with the same passion and excitement that I did this first day I started this. And I have been compelled to let everyone know. I want you to know that your event means so much to me. It means you saw our hard work, all the years, all the passion filled moments. You took the time to reach out and explore the possibility of working together, and that makes my heart explode with joy. I wish we were perfect for everyone, that I could drive to your venue that is an hour away, book your Christmas event, or take on another event on an already booked date. But we decided to make this a place of long term passion. Where we create from a place of deep love and understanding of the art of flowers and event design. Of 13 years of perfecting, learning and understanding what elements create a perfect event and to 13 more. We only take on what we are 100% sure we can do, and do correctly. Thank you for challenging us and making us the designers we are today. Here’s to a fun 2019 season. When establishing what type of designer I would evolve to become I distinctly remember wanting to combine my previous world of fine art with my current work of flowers. I studied various forms of painting while growing up, as my mother was not only very fond of keeping me as busy as possible but she too was an artist. Summer was jammed packed full of art classes and ballet workshops. I currently still see both of my parents create art. My house has a piece of their work in almost every room. After working for a fine art gallery in Houston after college, I started to understand the community and their dynamics. It taught me that patience, consistent practice and an undercurrent of maddening passion is required to be successful in art community. Fast forward 10 years and here we are. Never in my wildest dreams could I have dreamt this big. Owning a business that is solely focused on creating floral art work is exactly where I was meant to be. I now know and fully understand that all those small steps that life gave me lead me here. One day opening a magazine and seeing our work as the advertisement for The Museum of Fine Arts Houston. For my art to be highlighted by this institution might be one of the highlights of my career. Because saying you’re an artist and being acknowledged by the Fine Arts community are two completely different things. Am I right? Here is the one page spread and bellow are some images from the gorgeous shoot we designed. I have to admit I have not been a huge fan of the traditional Fall color palettes. What comes to mind are the oh so typical orange, yellow and reds that have been combined in the most painful of ways. In 2018 I was determined to change my view and make Fall fun again. So off I went to explore color tones that were traditionally seen in weddings and combined them with the best of what Fall has to offer. I grabbed some copper tones with some soft mauvey blushes and mixed them with some seasonal textures that when combined made my heart skip a beat. We just got these images from the super talented Jen Dillenger and could not wait to share them with you. 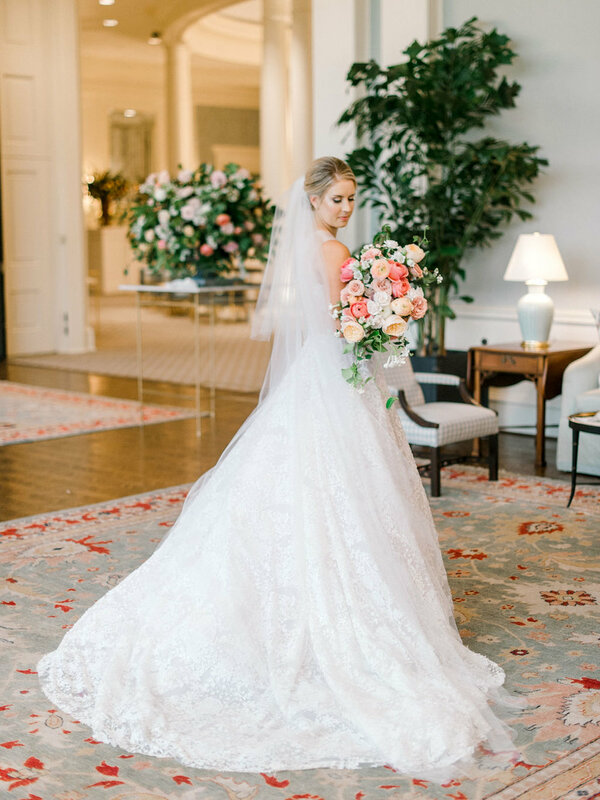 She captured these flowers perfectly and we are so proud of how everything turned out. We had to get away. Going on three months straight with out a day off can have its toll on you. The grind can own you. It’s bizarre, but it can get addicting. To step away can be scary at times as business ownership is very demanding. And at times we might make it feel more demanding than it is when we are feeling overwhelmed. What I have realized this happens more often when we don’t take time off. It is so rare that we get weeks without weddings, particularly this past year, that sneaking a last minute trip was the only way we could make it happen. So why not Paris. It had been on my list for a while and couldn’t believe I had made it this far without going. So Chris, my fiance, surprised me with the idea and 7 days before we jumped on the airplane, we got on our computers and booked the trip. Spontaneity is one of my love languages. I feel the need to make things happen when they are not planned helps keep me young and excited about the endless possibilities of life. I brought my camera and only took it out on some adventures. I can get all consumed with taking pics and not living in that particular moment that I need to edit the times I bring her. Here are some of the pics that I had to share with you, and only hope you can enjoy them as much as I did. The ones posted are some from around Paris, and mostly on a day trip we took to Versailles. When choosing your wedding & event photography there are so many decisions to make and we are not going to pretend we know a 10th of what is important. But when we see something that we love and is a representation of fine art… we will let you know. Film photography has made a come back ya’ll, and we love it! There is something so old world, so ethereal about the softness that is unparalleled to anything else I have seen. And one of our favorites in Houston that rocked this shoot is Chrisitne Gosch. Yes there are some limitations, so find a photographer that will do both digital and film… and boom no more limitations. You’ve actually added another element of art into your day that you will never regret. For this design concept we wanted to marry the garden style compote with garlands that have been to popular. We deconstructed some flowers and laid them through out the table to style and create a loose floral garland look. We’ve created this look for rectangle tables and rounds and think that it truly does adds a luxe element. It’s super unexpected and interactive. I think we are all used to having flowers in a vase or garland, but seeing them placed through out the table keeps your guest wanting more. Am I the only tactile person here? I have to touch that dress I walk by when shopping, and smell the rose on the side of the street. 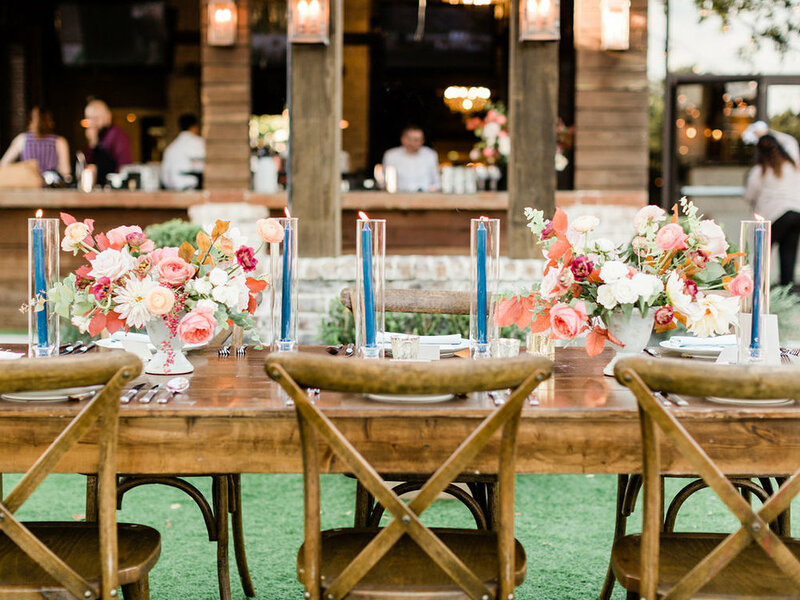 Adding flowers to a table will no doubt have me touching them or adding them into my hair. Let your guests interact, that’s what life is about. This past weekend, not different than most, reminded me the value of team work. Not only with my team at the studio but the team at the venue. To feel supported, cared for and thought of during the setup from the venue is something that has been elevated by The Revaire. Their team not only thought about how to make all the vendors have an easy load in and load out, they thought of how to keep them safe. They supply scissor lifts, ladders, easy load in, overnight storage of supplies, set ups starting days before, and breakdown on Monday mornings. But more importantly you feel like you are part of the team. These items and flexibility is what makes each event go smoothly, and feel less rushed. Breaking down an event on Monday allows us to stay off the roads in the middle of the night. Breaking down an event might be one of the most hazardous elements of our job. My team is tired and have been working 12hr days since Monday morning to make it all come together. By Saturday night everyone is EXHAUSTED!!! Not only are we not at our very best, but lets be real roads at midnight to 4am are not the safest in Houston, Texas. As we have one of the biggest drinking and driving record in the States. So I tip my hat off to you The Revaire for making us a priority. To make us feel like part of the team. We appreciate you and thank you. And side note, lets see if we can make this breakdown on Monday a thing. For our safety. PLEASE! Styling, design, floral and photography by Maxit Flower Design.